A mindfulness-based therapy could offer a "new choice for millions of people" with recurrent depression, a Lancet report suggests. Scientists tested it against anti-depressant pills for people at risk of relapse and found it worked just as well. The therapy trains people to focus their minds and understand that negative thoughts may come and go. In England and Wales doctors are already encouraged to offer it. Patients who have had recurrent clinical depression are often prescribed long-term anti-depressant drugs to help prevent further episodes. And experts stress that drug therapy is still essential for many. In this study, UK scientists enrolled 212 people who were at risk of further depression on a course of mindfulness-based cognitive therapy (MBCT) while carefully reducing their medication. Patients took part in group sessions where they learned guided meditation and mindfulness skills. The therapy aimed to help people focus on the present, recognise any early warning signs of depression and respond to them in ways that did not trigger further reoccurrences. Researchers compared these results to 212 people who continued to take a full course of medication over two years. By the end of the study, a similar proportion of people had relapsed in both groups. And many in the MBCT group had been tapered off their medication. Scientists say these findings suggest MBCT could provide a much-needed alternative for people who cannot or do not wish to take long-term drugs. In their report, they conclude it "may be a new choice for millions of people with recurrent depression on repeat prescriptions." Nigel Reed, who took part in the study, added: "Mindfulness gives me a set of skills which I use to keep well in the long term. "Rather than relying on the continuing use of anti-depressants, mindfulness puts me in charge, allowing me to take control of my own future, to spot when I am at risk and to make the changes I need to stay well." Providing an independent comment on the study, Dr Gwen Adshead, of the Royal College of Psychiatrists, said: "These findings are important from the point of view of people living with depression who are trying to engage in their own recovery. "And it provides evidence that MBCT is an intervention that primary care physicians should take seriously as an option." But he cautioned the research does not suggest MBCT is useful for all types of depression; nor that it should replace anti-depressant treatment for people with severe disorders who have needed hospital treatment or are suicidal. And experts caution patients should only reduce their anti-depressant medication under medical supervision. Prof Eduard Vieta, Professor of Psychiatry at the University of Barcelona, Spain, said there needed to be more studies to establish how effective MBCT might be. 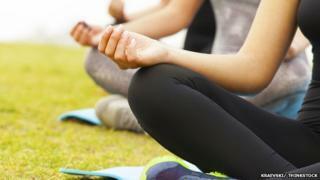 Researchers say their next step is to tease out what the active ingredient in mindfulness therapy might be, and to check it compares favourably to other group-based approaches.